MarketingProfs B2B Forum 2011 featured as keynote speaker Guy Winch, author of The Squeaky Wheel: Complaining the Right Way to Get Results, Improve Your Relationships, and Enhance Self-Esteem . Guy had us mesmerized as he explained How Your Unhappiest Customers Can (Paradoxically!) Help You Foster Fans... if you truly focus on handling their complaints, resolve their problems AND repair the relationship with them. The implications of his advice are far reaching. Think of all of the situations during which complaints arise: family interactions, with friends, as customers and business professionals. And, yet, when is the last time we've received professional advice or training on how to 'foster fans' and address complaints? 95% will not complain to a company. They prefer to relay to others excluding those who can fix the problem and will tell an average of 16 friends or acquaintances. Complaints create negative feelings which lead to apprehension, defeatist thinking, feeling helpless and powerless. Better to avoid the source of the complaint and funnel the energy into commiserating with others. Did you realize that this is a global phenomenon? In fact, I discovered Complaints Choir Worldwide [thanks to Dr. Winch mentioning the Helsinki Complaint Choir]. Unattended Complaints Do Damage To Relationships. They create a rupture in the "fabric of relationships" affecting trust - which in my mind is the holy grail! If you both handle the complaint and repair the relationship, you build loyalty and greater confidence that you'll listen, and resolve problems in the future. For all that we dislike complaints, they yield tremendous benefits. The more likely customers are to voice complaints, the lower the risk of attrition and the more likely customers are to share positive word-of-mouth endorsements. Think of them as a free focus group providing early warning of issues and problems. If we know about them, we can fix them, tailor our communications and discover unknown and unmet needs! It helps to give permission to voice complaints. Ask customers for feedback, using "I" statements in open ended initial questions. For example, "is there anything I could do better?" How To Repair the Relationship Wound? You need to handle the customer while fixing the problem. Three elements come into play: an effective apology, open communications about the process and great followup. To be effective, an apology must include regret and the person's specific feelings. 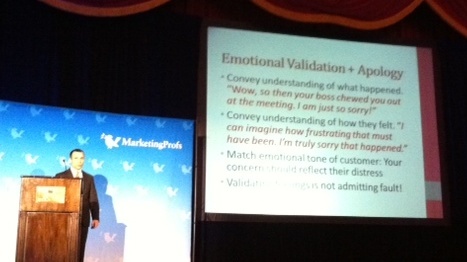 It must also provide emotional validation to match the customer's emotional concern. Only then can you and should you give your side. It's critical to manage your feelings! Manage your feelings then manage theirs. Realize that the visceral reflexive response is an auto response and manage it. A valuable technique to use is reappraisal or reframing. In so doing, you change the underlying feeling about the situation and reframe it in a more positive light for your customer. 3. Gather information about customers. 5. And practice complaint handling skills. What is the worst customer complaint situation you've encountered? And what happened as a result? Which of Guy's best practices did you find most helpful? 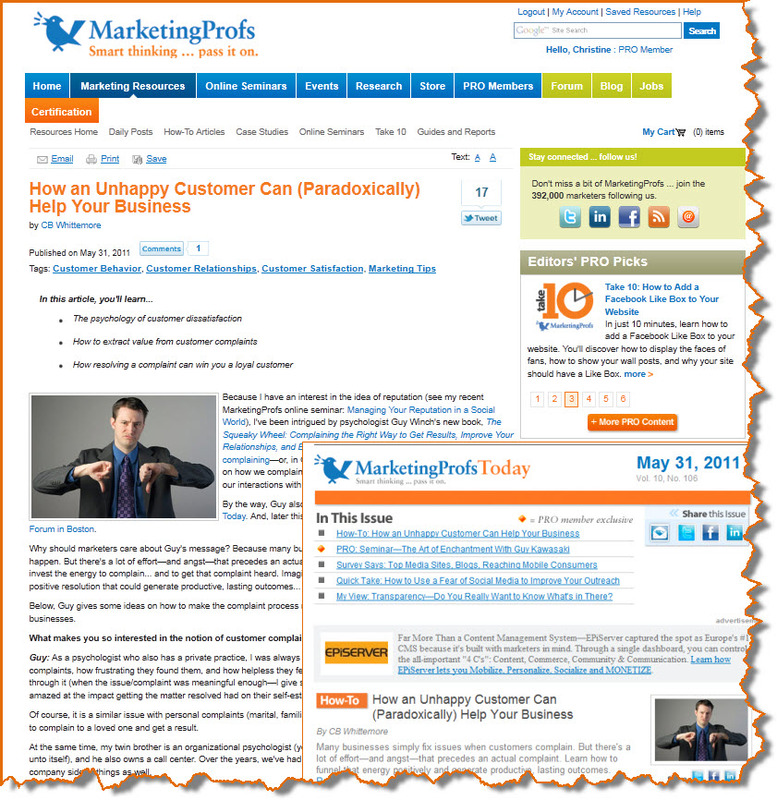 For 6/24/11, here are links and resources shared on Twitter and tagged #practicalmktr grouped here together in Practical Simple Marketing In The News. MarketingProfs events challenge my assumptions. In this case, Nancy Harhut's presentation about Tapping into Human Behavior to Increase Open, Read and Response Rates made me appreciate how much potential online marketing holds as we get beyond mechanics and fully embrace human behavior. phenomenal success of social networks [see BJ Fogg's Persuasive Bathroom Epiphany: MarketingProfs Digital Marketing Mixer 09]. Furthermore, the average America sees approximately 5000 marketing messages per day; we're constantly bombarded with information. No wonder we look for shortcuts! 1. People respect authority. They will scan to determine if they NEED to read. They will defer to people whom they perceive to be authority figures. 3. Gatekeepers make very deliberate assumptions. They want to avoid blame. If it looks important, they will assume it is. If they make a decision once, they tend to fall into that pattern. 4. People look at who and where mail is from. 5. We’re inclined to touch things. Interaction increases response rate/engagement. 7. No – really can mean ‘tell me more’. People buy solutions to problems, so maybe the first contact didn’t connect. Try again. 8. Some responses are automatic. For example, “compliance triggers” produce automatic yes. Coupon or rather dashed line that surrounds coupon will lift readership by 23% regardless of value, telling people 'because' leads to compliance. Easy, quick, improved will increase product sales. LONG copy – trustworthy compared to short messages. 9. People are most interested in themselves. We lose people when we focus too much on ourselves. Give people something. Help people fix a problem. Deliver good news. Feel superior. Share something that you aren’t supposed to hear. 10. People make decisions for rational and emotional reasons. You need to address both sides of argument. 11. Avoidance of pain. More powerful motivator than achievement of pleasure. Loss can be twice as powerful a motivator as gain. 12. People feel obligated. The principle of reciprocity – we like to pay in kind what someone does for us. We also want what we cannot have. Principle of scarcity: if it's scarce – we want it. Most convincing if the testimonial suggests. It starts where the prospect is and moves them along. If you don’t use someone like your prospect, use someone your prospect likes. By the way, Nancy Harhut is Chief Creative Officer at The Wilde Agency. This video of Nancy, despite the introduction in Portuguese, gives you a feel for some of the perspective Nancy offered us during this MarketingProfs B2B Forum presentation. Thanks, Nancy, for a thought-provoking session! How might you apply your awareness of these behaviors to your communications with customers? What about some of the direct mail or email communications you've received? Where you aware of responding in one of the ways described above? I know I'm going to be paying closer attention! Happy Friday! 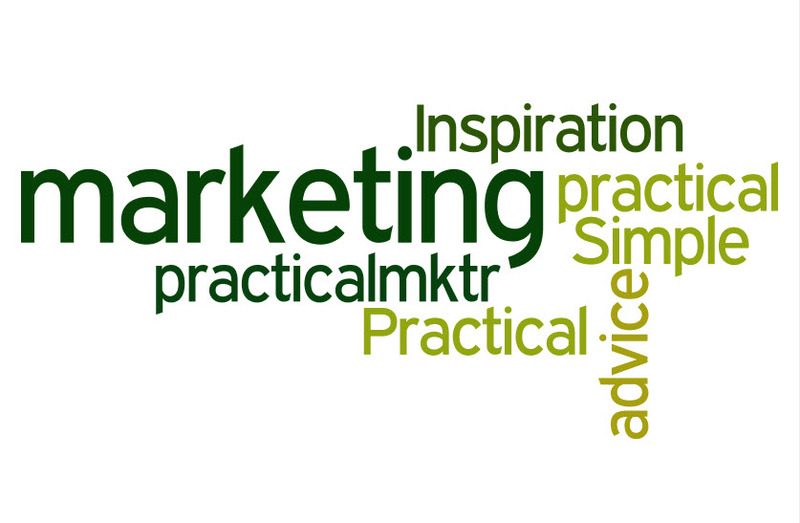 Here are for this week ending 6/17/11 links and resources shared on Twitter and tagged #practicalmktr grouped here together in Practical Simple Marketing In The News. 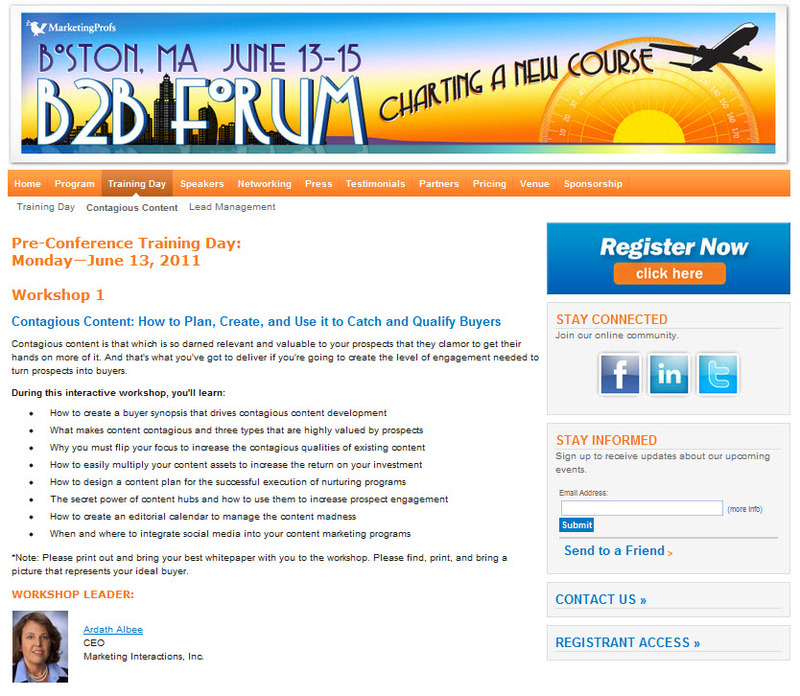 I've only just started my MarketingProfs B2B Forum 2011 experience with a full day in Ardath Albee's Contagious Content Marketing: How to Plan, Create, and Use it to Catch and Qualify Buyers workshop and already my brain is on fire. Ardath has brought to life the notion of storytelling in business and I can't get enough of it! Stories are how we justify everything that happens in our lives. If marketing is more like storytelling, we can count on more engagement from potential customers. A story represents a narrative that educates, entertains, and engages. A story should always be told from the buyer's perspective. More specifically, the beginning of the story is about the buyer, who becomes aware of a problem, and feels pain escalates. The middle of the story is about seeing resolution, encountering obstacles, and finding expertise. In the end, the buyer overcomes challenges, solves problems, and emerges as hero of the story. To put storytelling into context, "Story gives people enough space to think for themselves." Annette Simmons, author of The Story Factor (2nd Revised Edition). 2. setting: vertical, problem, culture [will be specific to environment]. Context motivates engagement. 4. Conflict – who must the hero convince, what has the villain caused, what obstacles must the hero overcome. Need to address all sources of conflict. 5. Climax – will it be the status quo or change? Will deals stagnate might they move forward? 7. Dialogue – the words used and how tell story. Imagine putting your customer's issues into storytelling terms... Wild, don't you think? At the same time, it really makes you carefully consider - and appreciate - what your customer goes through and inspired you to come up with more relevant solutions to their problems. For more perspective, listen to Ardath Albee's recent keynote at DemandCon. The video embedded on her site includes sections about Using Storytelling and the 7 Elements of Business Stories. Click on the video link, listen to Ardath's brief introduction, then click on Watch a Segment. From there, you can select the segments I mention - or listen to all of them. Here, for the week ending 6/10/11, are links and resources shared on Twitter and tagged #practicalmktr grouped here together in Practical Simple Marketing In The News. Lots of #practicalmktr Twitter change afoot: photo uploads, new search features. Detail: http://ow.ly/5aDKJ Reactions? Talk about exciting news!... 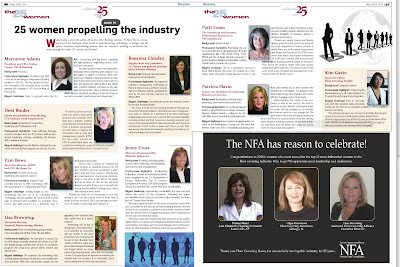 Floor Covering News has just published its 25th anniversary issue - dated May 16/23, 2011. It's an impressive 132 page issue filled with milestones recapping the last twenty-five years in the floor covering industry. 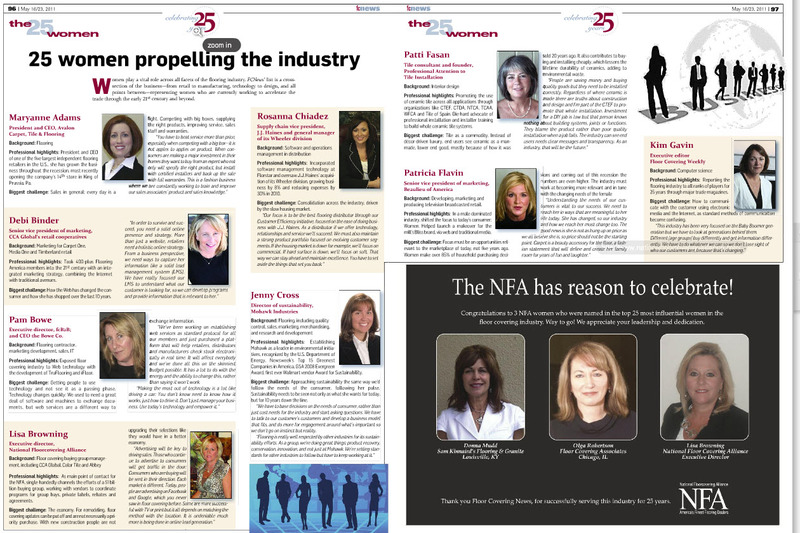 It also highlights 25 flooring women to reckon with! Check it out by clicking on this link for the digital issue of Floor Covering News' 25th anniversary edition. Deb Binder was a very early contributor to Flooring The Consumer with her post Putting Women in Their Place - Front and Center. Vickie Gilstrap has contributed color stories and carpet style inspiration to the Carpetology Blog. I've worked with Dana Teague because of Hanley Wood's Surfaces Education Advisory Council. And, I've desperately wanted to tour Emily Morrow's floor covering showroom for visions of the future of flooring. I am honored to be in such company! Congratulations and Thank You, Floor Covering News! I hope you've had a good week. 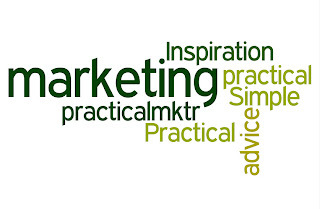 Here are links and resources shared on Twitter and tagged #practicalmktr grouped here together in Practical Simple Marketing In The News for this week ending June 3rd, 2011. 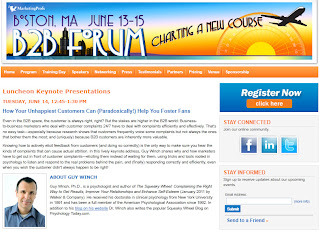 Imagine my delight when I discovered that Guy Winch, author of The Squeaky Wheel: Complaining the Right Way to Get Results, Improve Your Relationships, and Enhance Self-Esteem , would be a keynote speaker at the MarketingProfs B2B Forum 2011 in Boston, June 14-15. You see, I did a blog interview with Guy on Flooring The Consumer in a post titled Guy Winch: How To Complain & Get Results - The Squeaky Wheel. 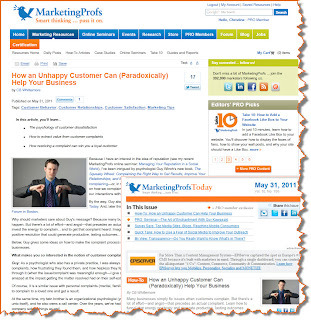 That post forms the basis for my recent MarketingProfs article titled How an Unhappy Customer Can (Paradoxically) Help Your Business. Intriguing, don't you think? And very relevant, too. I'm looking forward to hearing Guy and meeting him in person. 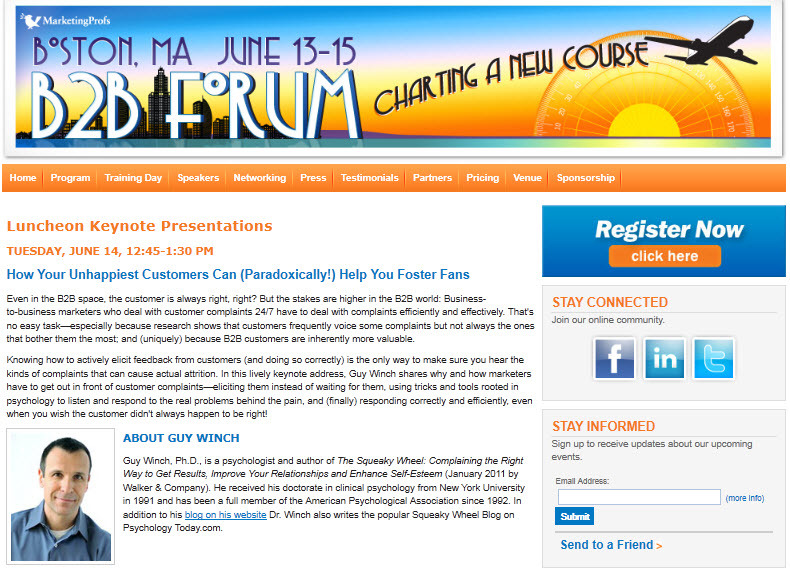 As you may know, I'll be presenting with Kipp Bodnar from Hubspot about How to Generate More Leads With Social Media. It's been intense preparing [especially given a hard drive crash that wiped out one brilliant version of my presentation], but I'm looking forward to generating discussion about a topic that perplexes many savvy marketers and business people. I am eternally grateful to several wonderful friends - Bill Buyok, Pam Kozelka, Valerie Fritz, Mike Klassen and Michael Cohn - who shared with me their lead generation experiences. 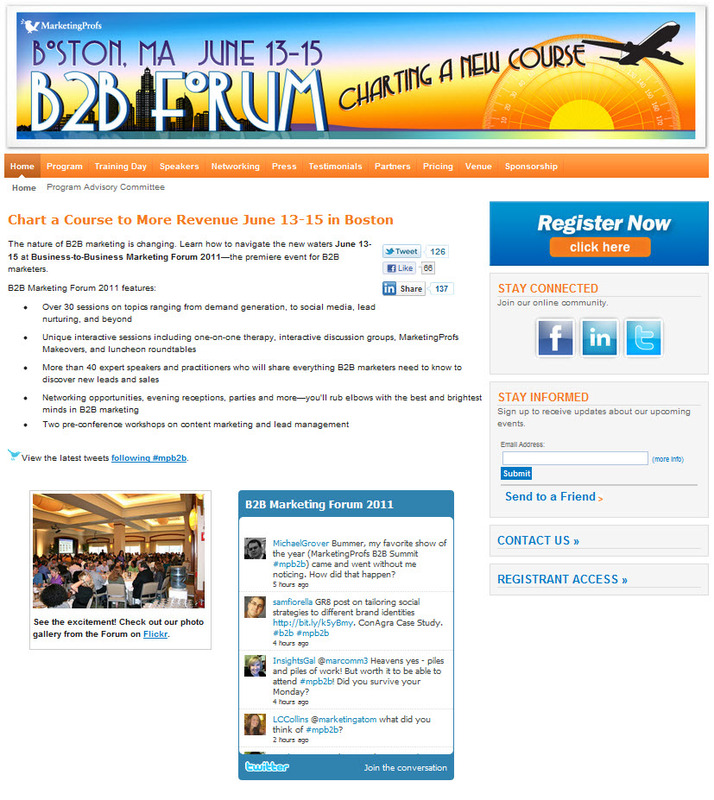 If you haven't yet registered, you can do so by clicking on this link which will take you to the MProfs B2B Forum 2011 site with details on speakers and topics. When you register, be sure to enter discount code SPEAK100 to save $100 on the registration fee. While you are at MProfs B2B Forum, plan on attending a live #Blogchat with Mack Collier. 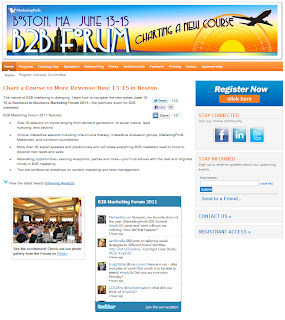 Here are details: Live #Blogchat is Coming to the Marketing Profs B2B Forum! And, if you can't make it in person, don't fear! There's a virtual option! 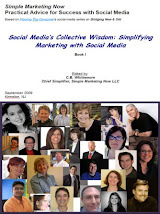 I'll definitely share with you what I learn about Unhappy Customers, Lead Generation, Guy Winch all at the MarketingProfs B2B Forum 2011 and would love to include your perspectives.